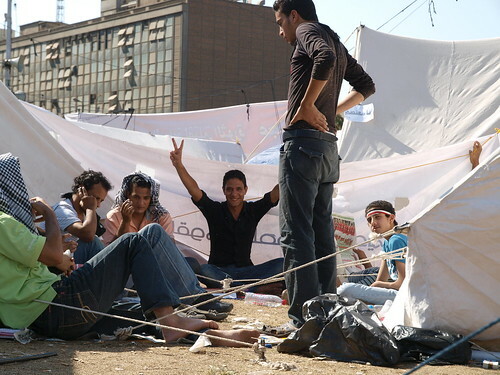 The camp on Tahrir enters its 22nd day – and the square is taken, not by the military nor by thugs or the police as so many feared since the clashes of Abbasiya last week. Friday July 29 millions of islamists took the square and all the surrounding streets. The three big islamist organisations – Muslimbrotherhood, Salafis and Al-Gamaa Al-Islamiya – showed their power and brought people from all over the country by bus to the square. No chance for the 28 secular groups that had called beside the islamists and hoped for a „friday of unity“ of the different groups that have split in may after fighting side by side against the Mubarak regime during the revolution. In the early morning there were still fight about poster calling for an islamic state – at the time of the midday prayer the islamists had taken over. Chants for an islamic state, the islamic law, against „atheist“ press all over the square, „million greetings to Tantawi“ and shouting in favor of the SCAF. July 23rd when a march against the SCAF was blocked by military and police and attacked by thugs, activist Amr Gharbeia was catched by thugs when going to the metro station, beaten badly and taken to the military police who arrested him. He got free the next morning after a huge number of people called for his release, including human rights organisation amnesty international. 1. He was arrested by apparently paid thugs, later the group „We are sorry Mr. President“ declared themselves responsible for arresting him, a group openly on side of the former regime, Mubarak and the NDP. 2. Amr is quite tall and has very long hair. When being arrested the group mentioned called him „gay“ for the long hair, not a man, crying etc. they apparently beat him badly and pulled him by his hair through the street. 3. They called him a member of the 6 april movement and a spy – following the accusations the SCAF made against the protesters before. Since arresting the „spy“ Ilan Grapel some weeks ago, the SCAF intensified its propaganda against the protests being organized and paid by „enemies“ from outside. In his statement from last week he accused for the first time a specific group – 6april movement – of being agents of forces from outside, trying to spread chaos and instability in Egypt. The „We are sorry Mr. President“ group put fake pictures on their Facebook-Site showing Amr beside the „spy“ Ilan Grapel. 5. 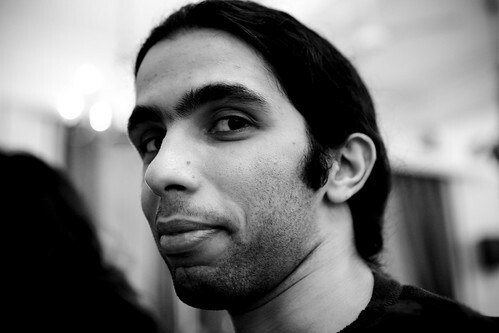 Amr got free after one night, mainly due to the pressure of his friends and supporters. The spontaneous campaign supporting him through Twitter, Facebook etc. it seems was the best protection he could get. Saturday afternoon a huge march against military rule started from Tahrir Square, Cairo, and went to Abbasiya in Heliopolis, the part of Cairo where most of the military institutions are located, including the headquarter of the military council (SCAF) and the ministry of defense. July 23 is the day of celebration of the 1952 Revolution when President Nasser and the Armed Forces came to power. 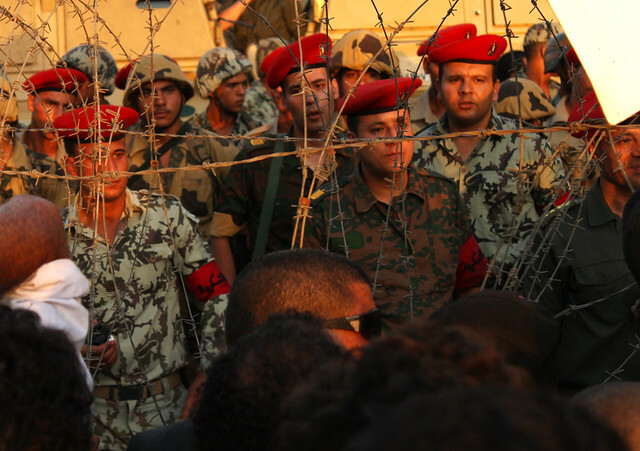 In Abbasiya, at 7pm, the march was suddenly stopped by military police with barbed wire. At the same moment people surrounding the protesters started from one moment to the other throwing stones and attacking them with knives and molotov coctails. The army apparently surrounded the protesters so they had no chance to leave. Many of them tried to find shelter in a mosquee nearby, apparently the riot police CSF fired teargas at them. Others report there was only a small sidestreet left to get out, thugs were gathering in the streets waiting to catch protesters who tried to get out and beat them up. It seemed that they were also waiting around the two metro stations nearby to catch protesters who tried to get back to the square. After 9pm the situation calmed down. When ppl gathered again and shouted against the army, the military police fired tear gas. Around 10pm most ppl left. Warnings: In Abbasiya thugs everywhere in side streets, try to arrest everybody who looks like a protester. Blogger @nazlyhussein is watching how the thugs were supervised by an army officer – he pointed at certain protesters and they went to catch them. People trying to get back to Tahrir. Situation there seems to be calm. BBC reports about 150 injured. The ministry of health said 25 person are in the hospital, 120 had to be treated on the scene – it can be expected the number will be higher in some hours. Update (1:40 am): The health ministry now speaks of 269 injured. Reports of 2 dead, not confirmed. Protesters on Tahrir tell that a lot of injured people arrive there, some severely injured, they were afraid to go to hospitals or doctors and will be treated on the square. According to lawyer many people were arrested. Since Friday the SCAF published two new statements – and General Tantawi hold a speech on TV for the 23rd of July, day of the military takeover of Nasser 1952. 3. The SCAF calls all the people to be careful and not to follow such attemps and resist all of them. THE GOD Bless us . The peace on the square lastet two weeks – now its seems it is over and it’s happening what so many ppl on the square feared for days. 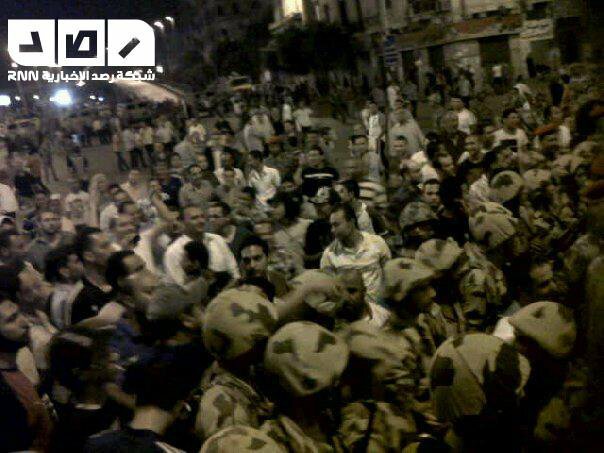 Yesterday, Friday, protesters in Alexandria and Suez were attacked by the armed forces. 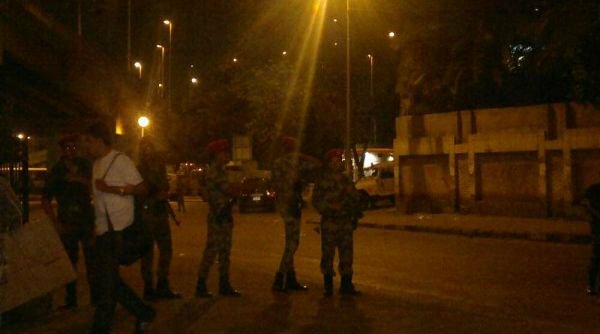 In Cairo a solidarity march left Tahrir Square in the late evening, several thousands marched to the headquarter of the military council (SCAF) . The army blocked the way with tanks and armed vehicals and shot in the air to disperse protesters – the shots can be heard on thisvideo. 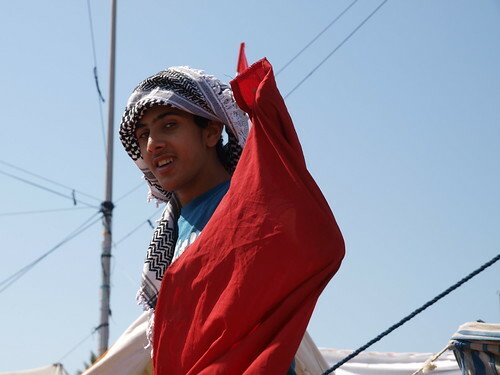 The people of the neighborhood of Abbasiya, Helippolis, joined the army and helped to drive to protesters out, they were shouting „traitors, traitors!“ to the demonstrators. Around 3.30 am (Saturday morning) the protest was dispersed. 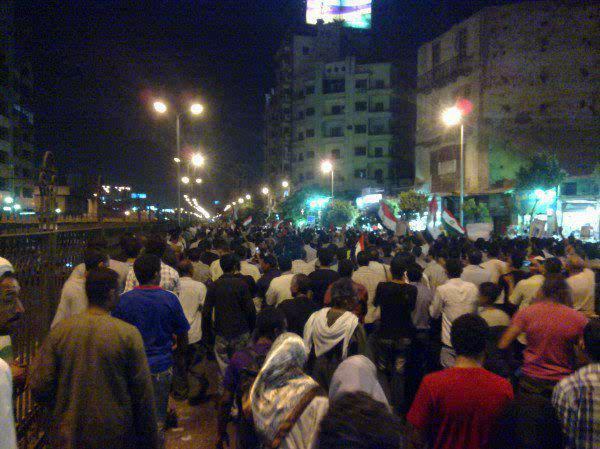 The sit-in in Tahrir and further sit-ins in many other cities of Egypt are about to enter their 8h day. And prepare for friday: Tomorrow another million-march will take place, in Cairo in other cities in support. Unlike last week, the muslimbrothers are not taking part in the march this time, still it can be expected to be big – the last days the protests in Tahrir were growing from the day to day, especially after the statement of the military council on Tuesday, when General Fangary warned the protesters to further damage the country. „Sharafs government on the edge“ writes now even the state-run newspaper Al-Ahram. Prime minister Sharaf is indeed fighting to stay in his job: He announced that 600 police officers will be thrown out in the next weeks, he also released a first list with names. The new cabinet, according to the news, will be announced on Monday – but today news came out that minister of interiour Al-Essawy, one of the persons the protesters most wanted to leave, will stay in his job. Über Tage hinweg äußerten sich weder der Militärrat SCAF noch die Regierung zu den Protesten, die das ganze Land erfasst haben. Einzig eine nichtssagende Rede von Premier Sharaf am Samstag, die mit Buh-Rufen vom den Protestierenden quittiert wurde. Die wurden inzwischen immer mehr: Statt weniger kommen jeden Abend mehr Menschen auf den Tahrir, der Platz ist auch noch um zwölf nachts gepackt voll, Junge, Alte, Männer, Frauen, viele Familien mit Kindern, die Stimmung ist unglaublich schön. Auch in Alexandria, Suez, all den anderen Städten: keine Spur von Rückzug, im Gegenteil, es scheint, dass die Proteste nicht mehr zu stoppen sind – und die Regierung reibt sich die Augen und weiß nicht was sie sagen soll. Dienstag abend Ankündigung von Sharaf, dass er zwölf Minister entlassen werden. „Sinnlos, sinnlos!“ skandieren die Protestierenden auf dem Tahrir und fordern seinen Rücktritt. Heute 12 Uhr seit langem die erste Fernsehansprache des SCAF. General Mohsen El-Fangary, Mitglied des SCAF, der auch Mubaraks Rücktritt verkündet hat, sagt in 3 Minuten mit aggressiver Sprache und Gestik, der SCAF werde nie zurücktreten und warnt alle, die weiterhin mit Protesten das Land stören. Die Ansprach hat den gegenteiligen Effekt wie beabsichtigt. Zunächst sind die Protestierenden geschockt, im Camp auf dem Tahrir herrscht am Nachmittag eine gedrückte, angespannte Stimmung – viele erwarten einen baldigen Angriff nach diesen Worten. Aber dann, am späten Nachmittag, strömen mehr und mehr Menschen auf den Platz, am Abend ist er brechend voll – und der Protest richtet sich nun allgemein nicht mehr gegen die Regierung, sondern direkt gegen das Militär. In Alexandria und Suez besetzen die Demonstrant_innen alle zentralen Straßen. Das Militär sieht sich gezwungen zurückzurudern – und der SCAF gibt am späten Abend seine erste Pressekonferenz. Ausschweißend und bei heiklen Themen wie den Militärtribunalen abschweifend beantworten zwei Mitglieder des SCAF die Fragen der internationalen und nationalen Presse, betonen wieder und wieder, dass sie nur die Forderungen der Revolution umzusetzen gedenken und das Beste für das Land wollen. Richter dürfen künftig nicht mehr mit der Presse sprechen. Der Trainer des (revolutionsnahen) Clubs Zamalek wurde entlassen, offenbar da er die Revolution unterstützt hatte, er wurde von einem Ex-Militär ersetzt. Der Vizepremier Yahia El Gamal tritt zurück. Der Oberste Gerichtshof ordnet an, dass die Verfahren gegen Ex-Regierungsmitglieder öffentlich auf Bildschirmen vor dem Gerichtsgebäude übertragen werden – eine Forderung der Demonstrant_innen. Youssef Wali, Agrarminister unter Mubarak, wurde verhaftet. Der Premierminister ordnete die Freilassung des Bruder von Mohamed Zein El Abdeen an. Mohamed wurde während der Revolution getötet, sein Bruder bei den Protesten am 27. Juni festgenommen, als er einen Polizisten angriff, der seine Mutter getreten hatte. SCAF kündigt an, die Parlamentswahlen werden am 30. September stattfinden. Keine Verschiebung der Wahl wie von den Protestierenden gefordert! Sunday afternoon the army finally took action after days of silence – and attacked the Suez protesters after they had threatened to close the channel. Army send more troops to protect the channel. Battle the whole night, at least three deads. Already the days before protesters in Suez had closed several main roads, the commercial movement in the city is down. The harbour workers, at strike for three weeks have joined the protests, as well as the workers of several factories, also at strike. Long lifestream from a small sit-in in Suez here, the quality is not always good, but good to get an impression of the ongoing protests. 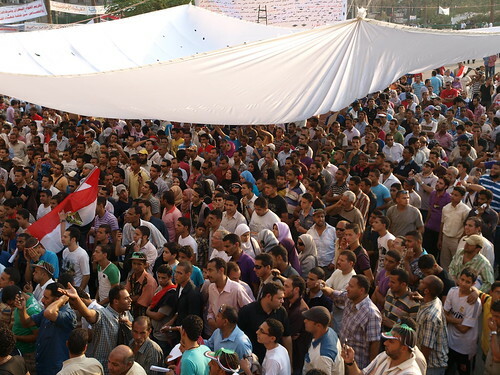 Still tenthousands in Tahrir Square, Cairo, number growing as the sit-in enters its second day. 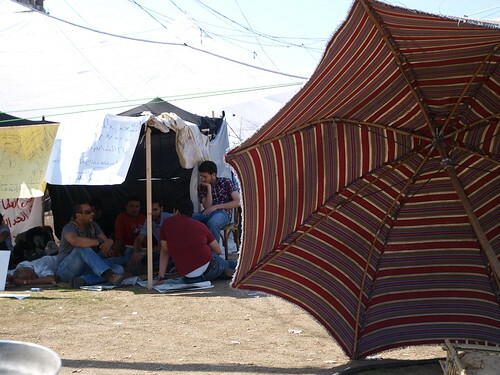 The camps are well-organized now, there is internet-connection, water, food, the mood of the protesters is very good. All the roads around are closed, the entrances are well controlled not to let enter any people with arms. From the stages music is playing, speakers give news about the protests in other cities. Protests and Sit-ins in Suez, Alexandria, Assiut, Aswan, Ismailia, Port Said, Luxor, Mansoura, Sharm el Sheik and more cities all over Egypt. The university teachers and professors are participating in the protests. Protesters in Port Said and Suez started a hunger-strike. Premierminister Essam Sharaf and the ruling military council SCAF didn‘t say one word about the protest so far, neither before nor after the big marches yesterday July 8. 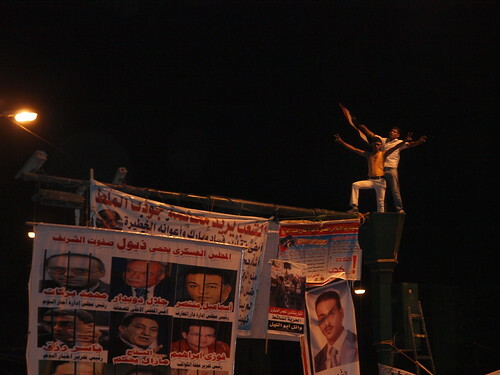 The SCAF ordered all state-run media, especially the TV-Channels, not to report about the protests. No everybody curious what they are going to say: For this evening Minister of Interiour Mansour El Essiawy announced to speak about the protests and the SCAF is said to announce a new statement. Right now, 21.30pm Premierminister Sharaf is speaking on TV. The protesters in Tahrir already answered Sharafs announcement before it began: If he want to speak he should do in thte square, in front of the people. And before the doesn‘t fulfil the demands, they will not speak with him. If he wants to talk to us, he can come to the squere. He sounds exactly like Mubarak five month before! Without names (of officers being trialed or fired) and without timeline his promises are worth nothing. Thank you Sharaf, like this, now even more people will join us in Tahrir! For a first analyses of the speech see here. From Tahrir Square, a spontaneous march went out through downtown, shouting loud against the premierminister. Du browst gerade in den Egyptian Spring Weblog-Archiven nach dem Monat Juli 2011.